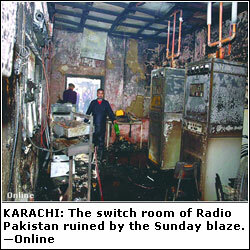 KARACHI, Oct 28: A huge fire in the century-old Radio Pakistan building on M. A. Jinnah Road gutted all the 14 studios and destroyed equipment and archival material worth millions of rupees, including instruments used since the first day of its broadcast operations. The fire, which broke out at 11.30am in Studio Eight of the building’s first floor, rapidly spread through the mostly wooden structure and caused panic among the children taking part in a flagship programme of the Karachi station ‘Bachon Ki Dunya’. They were evacuated before the fire department’s operation began. Officials said it took more than three hours to control the spreading fire and the ancient structure made the job a little harder as the firefighters took extra care to prevent further losses during the operation. The fire forced suspension of the radio broadcast for a couple of hours, which was later resumed through the standby transmitters. “Our 15 fire tenders took part in the firefighting operation. The tenders were assisted by almost a dozen water takers and fire tenders of the KPT (Karachi Port Trust) and the DHA (Defence Housing Authority),” said Chief Fire Officer Ehtishamuddin, who led the operation. He said the cause of the fire had not been determined but suspected that it might be the result of an electric short-circuit or a serious human error. Though, he said, the fire caused serious losses to the equipment, it could not damage the building in a big way because of its better architecture and well-planned construction. “By the end of our operation the first floor of the building was almost gutted but we succeeded in keeping the fire confined to the first floor till finish,” he added. Hundreds of people had gathered outside the historical building, which was enveloped in huge columns of black smoke. Later, the area police took the charge and drove the spectators, gathered at the gate of the building, to the main M. A. Jinnah Road to ensure smooth movement of the fire tenders. The historical building has housed the Radio Pakistan Karachi Station since 1949, when it was shifted here from the Intelligence School on Queens Road (now M.T. Khan Road) after a year of its broadcast operations. In 1949, the building was owned by a local government body and was later acquired by the Pakistan Broadcast Corporation. Sources in Radio Pakistan said the fire damaged almost all the 14 studios on the first floor of the two-storey building and burnt dozens of archival pieces, including musical and broadcast equipment preserved as relics of the past. He said the administration was assessing the losses caused by the fire but initial findings suggested the losses would be worth more than Rs20 million. The celebrated Studio-9, which had produced several mega-hit radio series, was also destroyed in the fire while huge facilities such as 14, B-2 and B-6, which used to host musical programmes and quiz shows, where people could attend such productions and participate live, were no more after the fire swept through the building. A chair belonging to Z.A. Bukhari, the first Radio Pakistan director-general, which was also presented as an honour to sit in to different dignitaries visiting the historical building, was also among the destroyed relics. 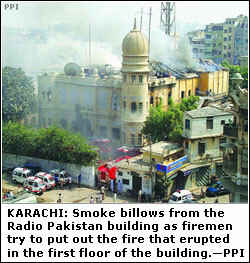 Iqbal Faridi, station director of Radio Pakistan Karachi, said the losses were worth millions of rupees but a committee to be formed by the Pakistan Broadcast Corporation would determine both the value of the losses and the cause of the fire. Ronaq Hayat, deputy controlling engineer of Radio Pakistan, did not see the studios destroyed by the fire getting back to operations in the near future. The incident also sent shockwaves up to Islamabad, where the DG of the Pakistan Broadcasting Corporation, Javed Akhtar, flew in here in the evening. “The DG is likely to hold a meeting with the Karachi station officials on late Sunday evening, where he may constitute an inquiry committee for the losses’ assessment and the cause of the fire,” said the source.